Does Kyle Thomas know how beautifully he plays the piano? 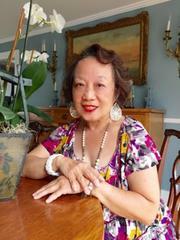 The Noblesville resident can hear the piano. But he can’t tell if it’s in tune. He can hear the volume, but he can’t distinguish the pitches. Thomas, who was born deaf, has played the piano since he was 12. “I taught myself,” said Thomas, 41, who can distinguish between high and low, loud and soft, fast and slow. Just like learning any new skill, playing the piano takes practice to do well. “It’s easy for me now, after all of these years,” said Thomas, who has developed a technique and understanding of what goes into the music, structure and theory. He plays so beautifully that he’s often sought after for local community theaters. “It is amazing that he can play when he basically cannot hear the music,” said Jan Jamison, director of Westfield Playhouse’s production, “33 Variations,” on stage weekends through Feb. 18. The play, interestingly, goes back and forth examining the creative process between Ludwig van Beethoven’s “Diabelli Variations” and the journey of a musicologist who has ALS, Lou Gehrig’s Disease, to discover why Beethoven, who while growing deaf, was compelled to write 33 variations on a simple theme. 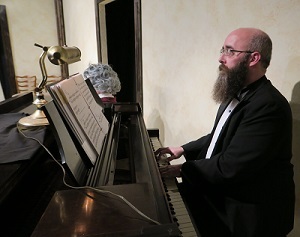 During Westfield’s play rehearsals, I watched and listened as Thomas sat at the baby-grand piano in his borrowed black tuxedo with tails, loud crazy-patterned socks and long, thick beard that he’s he’s been growing for a year. He played the variations throughout the play as they were mentioned. During his play rehearsals, he develops a sense of timing and learns exactly what to listen and look for, he said. Thomas said neither of his parents are deaf nor is he aware of any family history of deafness. When he was a baby, his parents noticed that he wasn’t responding to auditory stimuli, and doctors confirmed that he was indeed deaf. His mom actually taught at Indiana School for the Deaf but said her son didn’t show any interest in learning to sign as a child. So he was put into Washington Township Schools in Marion County. At school, he used hearing aids and other assistive-listening devices. Looking back, he’s always been performing in some way. As a kid, he acted out fairy tales, put on magic shows and participated in the usual school programs. As for learning the piano, both sets of grandparents had pianos in their homes, so he “did the usual banging on the keys.” And he said, “My childhood friends usually spoke of music lessons as being boring.” But it wasn’t until he saw the movie, “Great Balls of Fire!” in 1989 that he thought, “Wow, I wish I could play like that.” He started teaching himself, used old lessons books from his grandparents, then took lessons from his church organist. A turning point in his life occurred his freshman year at North Central High School, where he was cast, in 1991, in the play, “Children of a Lesser God,” about a deaf student and her teacher, and he began to learn American Sign Language beyond the basics. Then, he played in his first musical, “The Roar of the Greasepaint, the Smell of the Crowd.” From that point on, he was involved in so many shows that he lost count. He was on stage in most shows, acting and, if it was a musical, dancing and lip-syncing. And then he started getting asked to play the piano in shows. A brain damaged violinist has performed in concert with her best friend 29 years after they last played together after her mind was wired up to a computer to allow her to play notes using only her thoughts. Rosemary Johnson, 51, was a leading member of the Welsh National Opera Orchestra but her promising career as a soloist was cut short when she was involved in a devastating car accident in 1988 while travelling to a concert. Miss Johnson was left in a coma for seven months and suffered a debilitating head injury which robbed her of speech and movement, confining her to a wheelchair and leaving her unable to lift, let alone play, her beloved violin. 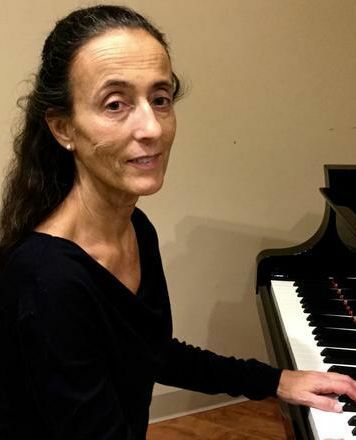 But in a groundbreaking project led by Plymouth University and the Royal Hospital for Neuro-disability in London, her brain was linked to a computer using Brain Computer Music Interfacing software, allowing her to compose and play music again. 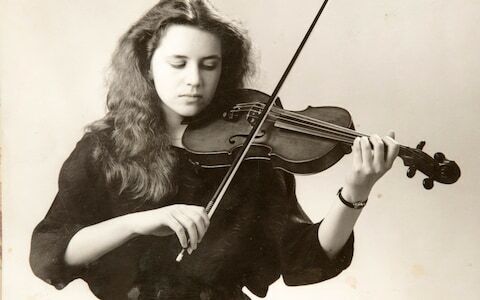 This month, for the first time she was able to perform with her best friend Alison Balfour, with whom she last played when they were both violinists in the Welsh National Opera Orchestra in the 1980s. 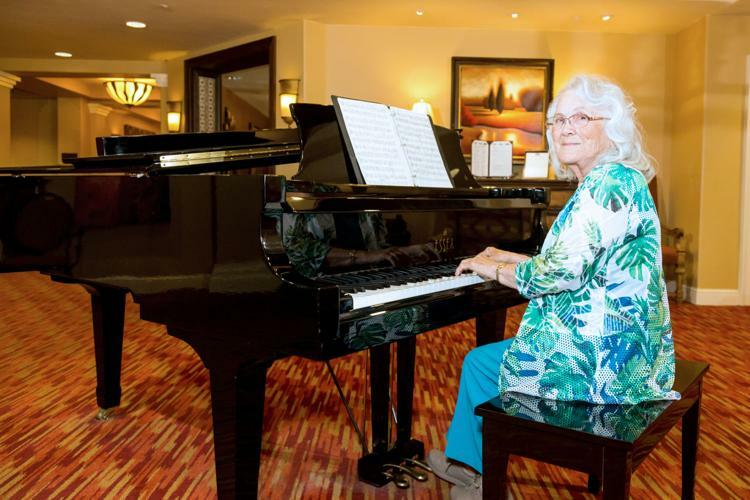 “The idea with playing with Rosie again after so many years was something I never imagined would be possible,” said Mrs Balfour, who now plays with the Bath Philharmonia. “I felt honoured to be doing this with her, to be her sound, her music, her violin and to have her next to me again was wonderful, really wonderful. “I can remember the first day Rosie came in. She had the kind of musical look about her that gave us confidence in what she was doing. I am a rank and file but she was a solo player, she was a numbered position. Whether tapping a foot to samba or weeping at a ballad, the human response to music seems almost instinctual. Yet few can articulate how music works. 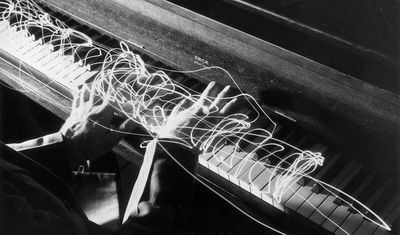 How do strings of sounds trigger emotion, inspire ideas, even define identities? Cognitive scientists, anthropologists, biologists and musicologists have all taken a crack at that question, and it is into this line that Adam Ockelford steps. Comparing Notes draws on his experience as a composer, pianist, music researcher and, most notably, a music educator working for decades with children who have visual impairments or are on the autistic spectrum, many with extraordinary musical abilities. Through this “prism of the overtly remarkable”, Ockelford seeks to shed light on music perception and cognition in all of us. Existing models based on neurotypical children could overlook larger truths about the human capacity to learn and make sense of music he contends. 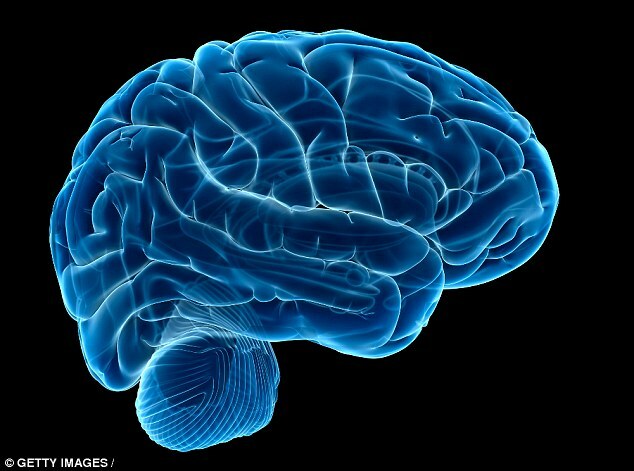 How the human brain processes music remains a mystery. Some of the children described in Comparing Notes might (for a range of reasons) have trouble tying their shoelaces or carrying on a basic conversation. Yet before they hit double digits in age, they can hear a complex composition for the first time and immediately play it on the piano, their fingers flying to the correct notes. This skill, Ockelford reminds us, eludes many adults with whom he studied at London’s Royal Academy of Music. Weaving together the strands that let these children perform such stunning feats, Ockelford constructs an argument for rethinking conventional wisdom on music education. He positions absolute pitch (AP) as central to these abilities to improvise, listen and play. Only 1 in 10,000 neurotypical people in the West have AP — the ability to effortlessly, without context, name the note sounded by a violin or a vacuum cleaner (“That’s an F-sharp!”). Among those on the autism spectrum, the number rises to 8%, roughly 1 in 13. For people born blind or who lost their sight early in infancy, it is 45%. AP, Ockelford argues, enables children to sound out and tinker with familiar tunes; that experimentation leads to a deep grasp of musical structure. Music is part of everyone’s life. It is all around us, all the time. It can be heard on the radio, in vehicles, at the grocery store and in our homes. It can be used to calm or to excite, and it can even be used to help the learning process. When a child becomes engaged in learning through the use of music, it stimulates them in more ways than just being easy on the ears. Tiffany Wibbenmeyer, a band instructor at Perry County School District No. 32, said that music positively affects students, and thata musical education can contribute to other areas of their learning. Many years of research have discovered that music facilitates learning and enhances skills that children use in other areas of their life. Making music involves more than just singing or playing an instrument with your fingers; learning through music makes children use multiple sets of skills at the same time. Through the use of music they learn to work their body, voice and even their brain together. Just by practicing an instrument, children are improving their range of motor skills, such as hand-eye coordination, much like playing sports. Children love to imitate what they see and hear around them. As the child copies things they see, they pay attention to try and imitate everything from actions to songs and words. According to the Children’s Music Workshop, the effect of music education on language development can be seen in the brain. Studies have shown that any kind of musical training helps to physically develop the left side of the brain, which is the part where language processing occurs. Children who are musically involved, versus those who are non-musical, also show signs of a higher neurological development and activity over time. By learning to read music and identify patterns, they are constantly using their memory to perform, even by reading from sheet music. It also promotes craftsmanship and discipline, such as dedicating time to learn how to plan an instrument or a piece of music. “Sometimes making up silly songs to go along with new material in a classroom helps students memorize things better in school,” Wibbenmeyer said. Listening to music has been proven to help young children detect different elements in sound, like an emotional meaning in a baby’s cry. 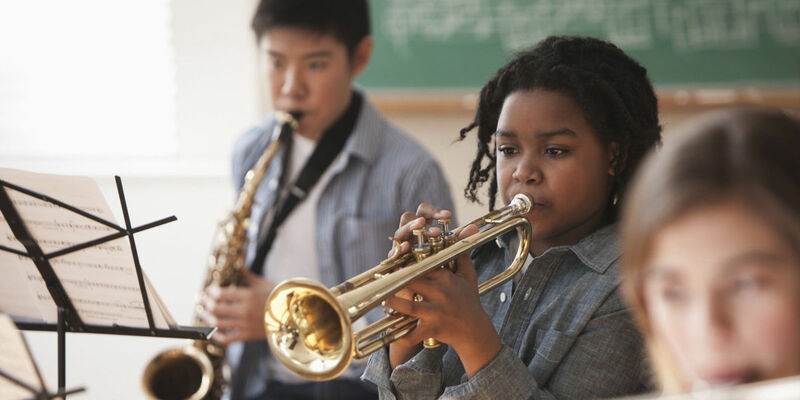 Students who practice music can have a better auditory attention to pick out patterns and sounds from surrounding noise. By understanding music and how it works, children are taught to visualize the different elements and how they perform together. This can train skills in the brain that are used to solve multistep problems often found in math, art, gaming and even computer work. Students also have been seen to improve test scores more than other students not involved in music. 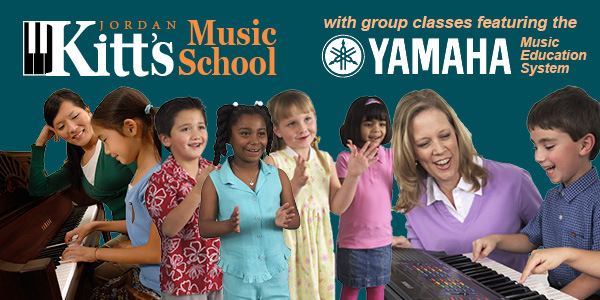 In a study published in 2007 by Christopher Johnson, professor of music education and music therapy at the University of Kansas, students from an elementary school involved in a superior music education program scored about 22 percent higher in English and about 20 percent higher in math on standardized tests. Another report indicates higher SAT scores from students with musical experience. Pensioners should revive their youthful dreams of becoming a rockstar, new research suggests. 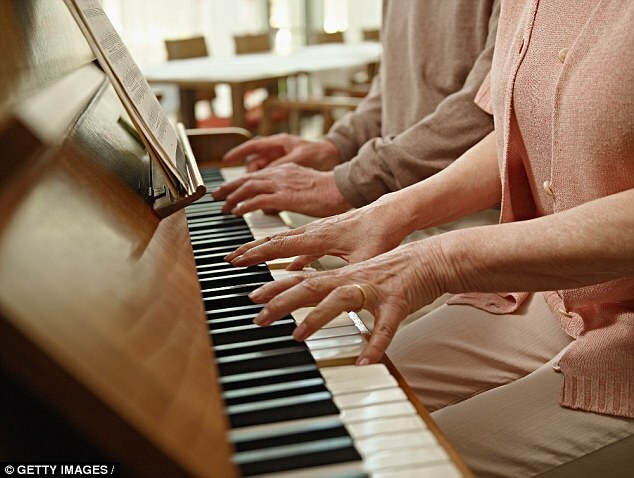 Learning to play an instrument could prevent their brain succumbing to the effects of old age, scientists claim. A study found musicians have faster reaction times than those who are unable to play the piano, drums or a guitar. Alertness is known to decrease in old age, but experts say picking up the skill could keep their brain healthy. Researchers from the University de Montreal, Canada, decided to see if there was a way to prevent the negative effects of aging on the brain. They compared the reaction times of 16 musicians and 19 non-musicians. The musicians had started playing between the ages of three and 10, and had at least seven years of training. There were eight pianists, three violinists, two percussionists, one double bassist, one harpist and one viola player. All but one also mastered a second instrument, or more. They were sat in a quiet, well-lit room with one hand on a computer mouse and their index finger of the other on a vibro-tactile device – a small box that vibrated intermittently. They were told to click on the mouse when they heard a sound from the speakers in front of them – known as audio stimulation. While they were also asked to click when the box vibrated – referred to as tactile stimulation. The largest ever study of music therapy’s effect on children with depression has found significant benefits. Recipients, aged eight to 16, also enjoyed improved self-esteem compared with those who received treatment without music, researchers from Queen’s University Belfast and Bournemouth University found. More than 250 took part and experts said it suggested the care should now be made available as a mainstream option. :: Young people aged 13 and over who received music therapy had improved communicative and interactive skills, compared to those given the usual care options alone. :: Self-esteem was significantly boosted and depression lowered. :: Even after music therapy had finished, social functioning improved long-term in all age groups. :: However, most improvements tended to be modest and short lasting and there was a higher drop out rate of 38%. T he findings were part of a Music in Mind study carried out in partnership with the Northern Ireland Music Therapy Trust. It concluded the results of the trial strongly indicated the need for further research to ascertain what type and dosage of music therapy was most effective, for whom and in what circumstances. Mental ill health affects up to a fifth of children and adolescents worldwide, including social, emotional and behavioural problems. Adolescent depression and anxiety frequently co-occur and extend into adulthood, the report added. The therapy used musical experiences within a patient/therapist relationship to achieve better health. A total of 251 children and young people were involved in the study, supported by the Big Lottery Fund, which took place between March 2011 and May 2014. They were divided into two groups – 128 underwent the usual care options, while 123 were assigned to music therapy in addition to usual care. All were being treated for emotional, developmental or behavioural problems. 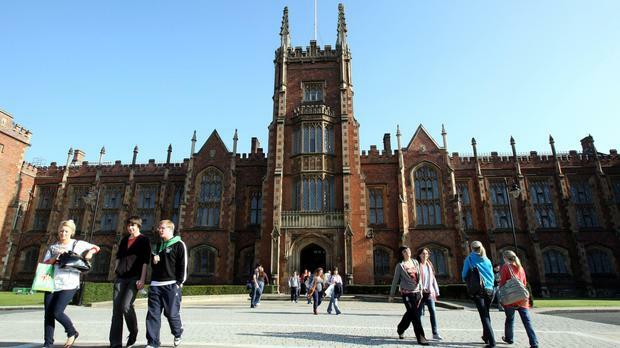 The Northern Ireland Music Therapy Trust said: ” The findings are dramatic and underscore the need for music therapy to be made available as a mainstream treatment option. Nine-year-old Hannah Gorham loves to sing. She loves Carrie Underwood and reading Fancy Nancy books, and she adores Bear-y, the tattered stuffed animal blanket she has had since birth. Her hero is Calysta Bevier, the 16-year-old ovarian cancer survivor from Hannah’s hometown of Grand Rapids, Ohio, who advanced to the semi-finals on the popular NBC show America’s Got Talent. And Hannah’s therapeutic savior might just be music. In ProMedica Toledo Children’s Hospital since Aug. 31 for severe migraines, Hannah was introduced recently to music therapy, a growing practice for hospitalized children and those with developmental or physical disabilities. Operated through the hospital’s Child Life program, music therapy helps children and their families cope with stresses related to a child’s illness and the adjustment of a hospital stay. 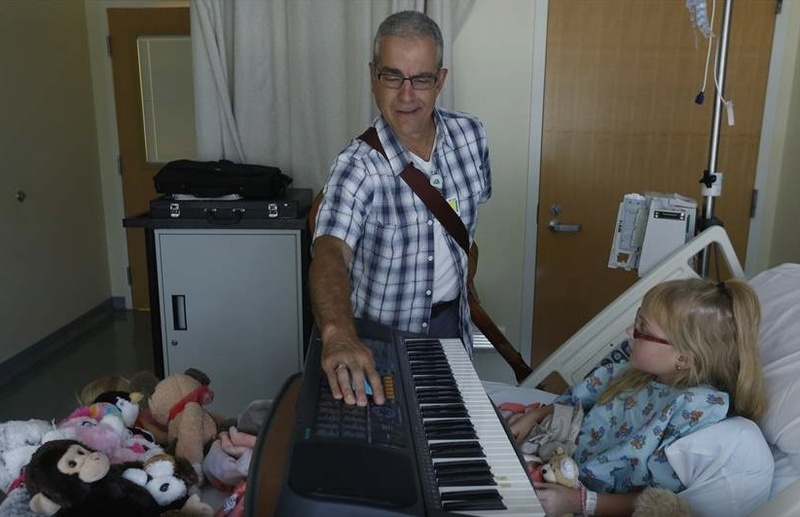 David Putano, a music therapist who owns a private practice in Toledo, visits children like Hannah at the hospital for weekly one-on-one musical sessions. On this particular Friday, surrounded by stuffed tigers, monkeys, and dolls, Hannah, a quiet, petite blonde with glasses, finds her place on the keyboard and joins Mr. Putano in making music. The pair first coordinate musical notes to a preprogrammed rhythm (this, time, they choose one reminiscent of an epic space movie; Mr. Putano often uses movie references to get students in the right creative frame of mind). As Mr. Putano plays the guitar, Hannah finds her happy place on the keyboard and joins in. Twice, the session is interrupted so that Hannah can take medication. Then, it’s back to the beat. Hannah watches intently as Mr. Putano searches for the perfect hip-hop beat on the keyboard. She clutches Bear-y as he explains to the young girl that there are 12 notes in music and helps her find the A note on the keyboard. “Play whatever you want … Atta girl!” he encourages. “You can tell when someone is really wired for music. You do really well,” he says to his tiny student as they finish up. Hannah was diagnosed two years ago with Chiari malformation, a congenital defect in which part of the skull at the back of the head is too small for the brain. “She started stuttering; she would trip over things and there would be nothing there,” said her grandfather, Rick Tolles, also of Grand Rapids. Her mother, Heather Gorham, was optimistic that music therapy would help. “Heck, it’s worth a shot. All of this medication is hard on her little body, but if something like this would work, that would be fantastic,” she said. The young girl had been getting migraines for about a year, but a week into fourth grade, they became severe, Mr. Tolles said. Now, when she gets a migraine, Hannah runs to her grandfather and hides in the crook of his arm to shield herself from the light. Music is considered to be a primary cognitive experience, meaning as human beings, we have no control over the emotions we feel when we experience it, Mr. Putano said. “If we can identify music that a patient loves, music they have positive associations with … if we can engage them in playing music that they really like a lot, we can instantly have them experience those positive emotions,” he said. Researchers have found that music therapy provides a diversion from negative feelings and helps manage the pain of not only adults but of children with developmental, physical, behavioral, and neurological disabilities, said Al Bumanis, a certified music therapist and now the spokesman for the American Music Therapy Association. Continued research with music shows effects on the subjects’ vital signs: blood pressure goes down, the heart rate slows, body temperature goes up; it calms and relaxes but also motivates.